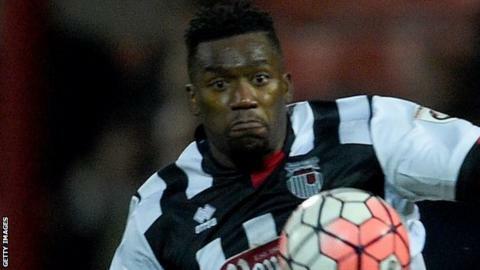 Jon-Paul Pittman's late strike helped promotion-chasing Grimsby Town come from behind to beat Bromley. Nathan Arnold missed two early chances to give the Mariners the lead, before Sean Francis headed managerless Bromley in front from Paul Rodgers' cross. On-loan striker Jon Nolan equalised for the visitors in his first start for the club, powering in from long distance. Alex Wall fired narrowly wide for the visitors, before Pittman turned in Arnold's cross to secure the win. "We fell behind in terms of games and obviously points, but I am delighted because I think that's the type of victory that the top two have managed to get. "Without it being pretty, we managed to get the job done and defended our box well after the initial goal which set us back. "It's very rare that you get the performances you want on a regular basis and at this time of year, because of the pitches and conditions, you have to dig deep." Match ends, Bromley 1, Grimsby Town 2. Second Half ends, Bromley 1, Grimsby Town 2. James McKeown (Grimsby Town) is shown the yellow card. Aristote Nsiala (Grimsby Town) wins a free kick. Substitution, Bromley. Bradley Goldberg replaces Adam Coombes. Attempt saved. Ben May (Bromley) header from the centre of the box is saved. Assisted by Joe Anderson. Attempt blocked. Ali Fuseini (Bromley) right footed shot from outside the box is blocked. Goal! Bromley 1, Grimsby Town 2. Jon-Paul Pittman (Grimsby Town) right footed shot from the centre of the box to the bottom right corner. Assisted by Nathan Arnold with a cross. Moses Emmanuel (Bromley) is shown the yellow card for a bad foul. Andy Monkhouse (Grimsby Town) wins a free kick. Alan Julian (Bromley) wins a free kick. Jon Nolan (Grimsby Town) wins a free kick. Attempt saved. Padraig Amond (Grimsby Town) right footed shot from the centre of the box is saved. Attempt missed. Adam Coombes (Bromley) header from the centre of the box is too high. Assisted by Joe Anderson with a cross. Alex Wall (Bromley) wins a free kick. Attempt missed. Alex Wall (Bromley) left footed shot from outside the box misses to the left. Foul by Evan Horwood (Grimsby Town). Lee Minshull (Bromley) wins a free kick. Attempt missed. Josh Gowling (Grimsby Town) left footed shot from outside the box misses to the left. Offside, Grimsby Town. Padraig Amond tries a through ball, but Padraig Amond is caught offside. Attempt missed. Sean Francis (Bromley) right footed shot from the right side of the box misses to the right. Assisted by Adam Coombes. Substitution, Bromley. Alex Wall replaces Reise Allassani.